Just 4. The center ones are not hooked in yet. Sorry, I was trying to edit my response to you and accidentally hit the submit button before I got beyond the number of speaker question. No worries, M. In answer to your questions, yes, I walk around a lot in the room. There is no question there is a difference in the soundstage when sitting versus standing up. The ribbons have a fairly wide horizontal dispersion, and a fairly narrow vertical one. So, there can be a significant difference standing up, especially in the perceived distance of the soundstage. But what is amazing is how instrument or voice location remains rock solid. It's almost eerie, to walk to the left side of the room, stand to the left of the left speaker, and still hear the right side of the soundstage over on the right side. In other words, the bass player is still "over there," right where he is supposed to be. I am still playing with the trim pots; I think the treble might be a bit hot, but it depends on volume and music. At low volume, bass is shy, so treble seems brighter. At regular volume, they just sound great. My ERRs are about 8-10 inches from the wall, about 12 feet apart. It is worth noting that my wall is free-standing, and the speakers are at each end of it, and surrounded mostly by open space. They are not in corners. Ceiling is high and angled, and the room is broken up by a number of different planes, and a variety of reflective and absorptive surfaces. I am working on both bass traps and diffraction panels as well. Not to hijack the thread, but for mac5u/Mike-yes I am the one that has talked with you over on the "Gon" about Ohm's. Sorry couldn't reply to your message, need I guess one more post, then I can! Yes, I am still very intrigued by the ERR's and want to take the plunge here at some point, but kind of biding my time and learning. I have to say again, the construction/quality of these just going by looks is enough to make me want a pair, let alone the work and design put into them. I am sure they sound as good as they look. Welcome to the forum! You could always make the trip this fall to Decfest at Steve's place. Mac5u/Mike, are you still planning on making the trip to Decfest as well? First of all, I have been remiss in not posting about my visit to your place. I had meant to do that after returning from my buisness trip to Orlando but one thing then another...anyway, I still plan to do a post about my trip but the details will be a little thin as my memory has faded a bit on everything we listened to that day. I had planned on attending both Decfest and RMAF but now may only be able to attend one. I'll make a decision soon. Cool that you found Decware. Since you have owned a couple different types of Ohms, I hope you get the chance to compare the ERRs. Someone here posted he thought the ERRs would be most comparable to the 3000 series which is what you have. If so, that would surprise me...and really say something about the ERRs. I am still hoping to make it to DecFest this year, though work is doing its best/worst to interfere. For now, I am just loving listening to the ERRs. Right now, I have R-men's I thought about you spinning. It's a 24/192 disc that is simply superb. The bass and brushes-on-snare contrast is amazing. Piano is lock solid. Just beautiful. mac5u, I have kind of watched the radial speaker evolve over time, have kept a keen interest in Decware for quite awhile, just more of a "lurker" in the background over the years. Always kind of kept an eye on things though. This version-the ERR though just looks to be the one that has really peaked my interest though. It has more of a cabinet volume maybe more closely resembling the Walsh 2, but overall height to my 3/3000's. The main radial driver is more closer to the 3/3000 though, and the ERR's ribbon tweeter makes it more interesting to me yet. I have been playing with the Ohm's in a more "omni" mode lately, one of my pairs of MWT's is an omni configuration by John at Ohm, and it is very interesting, soundstaging and the like. I have a couple more things I am trying with the Ohm-especially the 3000 in a true omni can, but at some point, I do believe I will give the ERR a whirl. Would make for an interesting comparison. I know this is the Decware forum, and I sure do not mean to drag Ohm into all this, but I find the comparisons too compelling and interesting. I hope you all will bare with me as I watch this forum for the ERR's. Pale, glad they seem to be doing the business for you so far. Keep the comments coming! Enjoy the tunes! Tim, as a former Ohm owner myself, I enjoy the perspective you bring, and under the forum charter, it certainly seems appropos. Thanks Pale, may I ask what Ohm's you have had/listened to, and what differences-or even similarities that you hear with the ERR's from that of the Ohm? I know that might be a difficult thing to explain perhaps, just looking at anyone's input that have maybe had the chance to compare the two, or have any thoughts on the them. I have had considerable time spent with my Ohm's, my 3/3000 uses the more conventional CLS driver/tweeter configuration, and a pair of the Micro-Walsh Talls in an omni configuration, tweeter firing towards the ceiling. The MWT was bought mainly for the intention of using it as surrounds in an "Ohm Theater" system, using my 3/3000's as front L/R and getting an Ohm center at some point. What I wasn't expecting was the interesting characteristics of just listening to the MWT/omni as the L/R in just 2-channel. Wasn't what I was expecting at all, and in some ways more interesting and natural than the standard 3/3000 configuration, just less bass/midrange fullness due to cabinet/driver size, but very fun to listen to. I do totally understand Steve's stance on the omni-directional upper frequencies and wanting to maintain a more typical directional firing arrangement. With the Ohm's, there are some trade-offs between the two arrangements, just not sure which I like best, find that I bounce between the two when listening to just 2-channel mode. I had hoped to be able to possibly put my order in for a pair of ERR's so that I could do some side-by-side comparisons, but due to some medical/health issues that will be put off probably until early next year. I am hoping the ERR's stay in production for awhile, I sure do not want to miss out on giving them a good listen in my room with my own gear. We will see! I see no problem comparing Ohms here either, there are probably a lot of people wanting to know the comparisons, so really its a good thing. I've heard a lot of Ohms in the past. There was a company I used to buy all my speaker parts from in Phoenix, and they seemed to get a lot of Ohms in for repair. I have now idea of which models I was listening to at the time, it didn't really matter I guess, it was kind of the bar for what had to be better. Some Ohms do some things better than the ERR's but overall I think the ERR's as a whole do everything just right. If you do come to Decfest, feel free to bring your Ohms with you, Doug that wrote his review on the ERR's had done this a couple of years before buying the ERR's. Not a problem at all, I hope you can make it! I see no reason the ERR's will go anywhere, anytime soon. The radials/omni's have been a passion of mine for a long time. I do hope you make it out to Decfest this year, it would be great to meet you in person. In a way, I'm glad you memory might be a little thin on what you heard. Like Murphy's law goes. everything you listened to with the Torii-MKI was pretty bad. In fact this took me on a long spiral of trying to figure out WTF! The tubes were on there last legs, with that said they didn't show itself in the normal way, it turned out to be very midrange heavy. Not sure why this happened or what it actually was but it had me running in circles for a month at least. Then when you listened to the desk top speakers (Trapeziums) at my desk, the amp was in mono, only playing the left channel through both speakers. I sat at the desk later that day, when I realized what you had just listened to, I was so embarrassed. Just perfect. I remember Steve telling me of a time at his old shop, in the early days of the RL-series radials, he had a customer come by for a listen, and when the guy left, Steve realized that one of the Radial drivers weren't even playing. Just goes to show you it can happen to anyone, at any time. Usually at the worst possible time. Tim, long time ago, I had a pair of Fs. Liked them very much, and often longed for their broad sweet spot when I was later building tall ribbon systems. Hope your medical/health issues work out the best possible way. We've discovered a fair bit of that in common with several of us here. Good luck. Bob, I really hope I can make it to DecFest. Not only would it be fun to see all the goings-on at the mother ship, but it would be great to meet everyone in person. Ohm F's, very nice I am sure! I have never heard the F's unfortunately, and maybe it is a good thing! What I hear from folks that have, say the newer Ohm CLS drivers don't hold a candle to the F's when they are working properly. Maybe so, but I do feel the newer drivers are a more commercialized and rugged driver than the real Walsh driver. Shame Lincoln Walsh wasn't around to hear his design with the F and maybe even develop it further. I enjoyed the heck out of my old Maggies. I ended up selling them to a neighbor long ago. Maggies and Quads hooked me on the broad planar category. The Fs were special, but there was a constant tinkering with the speaker to "get it right." it's been too long for any valid comparison, but the unique design of the ERR sounds more natural to me, keeping the benefits of the radial approach, and resolving some of the shortcomings of the Ohm. I still think the Ohm was better than almost anything else I heard at the time, but I do think it had problems with its upper mids and highs in terms of accuracy and detail, and smearing of the otherwise excellent soundstage. 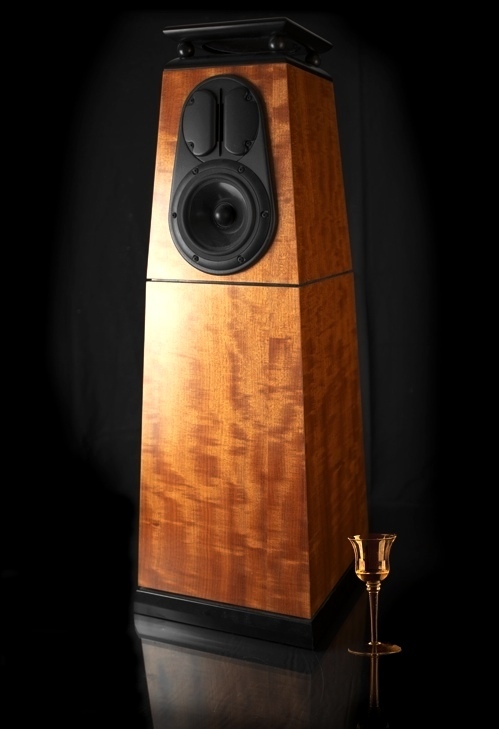 Of course, that was a long time ago, and for that speaker to be as good as it was, was quite impressive. Of course, here and now, having invested in the ERRs, I am "motivated" to like them as much as my ears permit. And I like them a lot. Someday I hope to hear a properly restored pair of F's. One of my friends in Virginia has a pair, so maybe some day. I do think that for the day in which they were designed and made, it is somewhat a miracle they worked and worked as well as they did. I do think the newer Ohm's are very good though, and not to take anything away from what John S. at Ohm does do with what he has now. They do that thing for me, but am always looking or listening for other designs. I don't make changes to my system often, very rare, but the ERR's might have to be an exception at some point. I can imagine with the ERR's, there wouldn't be much to not like. But do think radials/omni's certainly aren't everyone's cup of tea for sure, but they seem to be for me! Tim, I agree that the Walsh driver was a remarkable achievement. I wouldn't mind hearing a well-restored set of Fs myself. And I think you are right that the radial sound is in many respects a matter of personal taste. Electrostats can be that way, too. I am really very pleased with the ERRs; zero second thoughts. I expect this weekend to get the center channel set up, now that the ZRACKS and SE84ZS are here. Should be interesting. "Juan, your English is excellent!" He,he, I try to do my best. Sometimes is a compromise between time spent vs perfected typing and I've to choose in a balance way. "In regards to the live recordings: I don't have any room treatment so that may be a reason why I don't feel that live recordings are particularly compromised." No, Lon, just the opposite. As an example, live records sound specially good on headphones. I encourage you to have at least a pair, for instance, the Hifiman HE6 hooked up to the Torri Mk3's binding posts (cos these headphones require speaker amps to bring the best out of them). Or an AKG K1000 earspeakers. Apart from that, I noticed you purchased a PS combo recently. I have been interested in the PSA DAC + bridge as a music server while ago as well. It's a future acquisition for sure for my part. Very few companies sell something like these type of sources (Linn, Naim for instance). Control your entire music library with an iPhone or iPod touch is very rewarding and convenient. No external digital connections to deal with jitter and expensive cables. Just an NAS storage with lossless, perfectly ripped CD's and HD files. Inverted phase, native mode (non oversampling), etc.. So great. The AKG K1000 are here. They are simply a must have. Physical impact very similar to speakers, very dynamic and musical, amazing soundstage very similar like very near field monitors, ... I like them so much. Juan, thanks. I've been blessed with an interesting life, with sharp highs and deep lows, and I think I've learned from my experiences. I do have headphones. I spent about three years playing in and recording bands and I just tired completely of headphones. I have a pair around, but I don't use them, the headphone experience is not how I want to experience music. The PS Audio Combo is working very well for me (I don't have The Bridge, I'm not at this time interested in computer audio, don't own an iPhone or iPad, etc--I'm moving away from computer devices actually.) But the jitter free performance from discs is intoxicatingly good. Lon's comments about headphones are interesting. If I had to "work" in them, I suspect they could become quite tiring. And now that I have my ERRs, I am obviously not listening to headphones all the time. But headphone are what got me back into hi-fi, and while the enclosed headphone experience is, in its own way, unnatural, it can be very rewarding. Case in point: binaural recordings. When I had my first pair of Sennheiser HD414 headphones as a kid, I also had a binaural album Sennheiser had produced to show off the (at the time somewhat unusual) open air design of the headphones. And it was impressive. Today, there are some very good binaural recordings out there that can only sound good on good headphones. Here is one a friend recommended to me just this week, and it is indeed impressive: Ottmar Liebert's Up Close. I love the Blu-Ray experience, and the Oppo is both a very fine video and audio device. But it's a disc-based delivery, and in the end, what counts is what is on the screen and coming out of the speakers, not the disc itself. Any data file delivery of sufficient fidelity will do the trick. Apple is already heading down the path of disc-less delivery. They accomplished their most recent system upgrade without discs, their top selling laptop has no optical drive, and neither does their new mini. Hard drive makers are getting killed by the combo of flash and SSD. We've gone from revolutionary floppy drives to disc-less environments in about 30 years. With 32/384 A/V files on the horizon, optical discs are all but dead. We know something even better than Blu-Ray will be developed, but I am betting that something won't be a disc. And it won't take another thirty years. I know a lot of my audiophile friends revel in the vinyl experience, including the tactile and audio-visual relationship between disc and album art, etc. I don't begrudge them that at all, but I don't actually miss all my LP albums. I enjoy album art, but my iPad is fine for those purposes. And I suspect the vinyl vector will remain with us for some time. But it will eventually join wax cylinders. I believe vinyl has survived in part because it has taken relatively long for digital to reach mere adequacy, with many false promises and detours along the way. But digital is still younger than vinyl already was when I was born. Analog technology development simply cannot keep pace with Moore's Law and all the benefits that theorem implies. What the Sonore or Auraliti do for reasonable prices now, will be bettered by devices costing half as much in three years. And of course, there will be just as much, if not more, junk than ever. But the cream of the crop will continue to be amazing. Someone here, or maybe on the Hoffman forum, commented on just how far we have yet to go in reproducing live music in our homes. So true. What we settle for now is a facsimile experience. Even small-scale stuff, like solo vocals or small group chamber music, is still radically different live than recorded and heard at home. We are getting closer all the time, but we have far to go. Long term, only one storage paradigm can hold the amount of information necessary to replicate or approximate live music. And it's not analog. The vinyl groove cannot be made infinitely long, nor can the cartridge needle be infinitely small. Whether it is the reproduction end or the recording end of the process, we will always be testing the limits of a physical, "meat" universe. Recorded music is much like mapping. The only perfect analog map is a full-size replication of the terrain being mapped. However, digitally, we can store and recreate the actual terrain down to the most minute detail (already happening courtesy of the redoubtable, perhaps evil, Google Street View)—subject now only to storage space and the resolving power of the recording instrument and the viewing device. My iPad doesn't feel the same as a nice map, but it is way more accurate, with a nearly infinite capacity for improvement. Sounds familiar. P.S. Sorry for the rant. Back to my valves. Yeah, the PerfectWave combo could be considered a computer. But it allows me to use my discs. (And they sound as they never have before on a CDP or with a computer to DAC set up in my home. And I can control volume and source switching with its remote, which I could not do before) I have so many discs, it doesn't bother me to use discs, I prefer to continue using discs. I don't like using my iPod and I refuse to own a smart phone. And with the PerfectWave duo I don't have to connect up to the internet. More and more I think centering your life around the internet is a mistake. The internet has been a part of ruining our economy, shifting the way business is done, it's cost a lot of jobs. I had one external drive, lasted me six months and failed. Used it when I was living in both Austin and Houston because of my late wife's illness. Music off the computer was neither more convenient nor sounded better to me. So I'm not going there for the heart of my system nor do I have to. Cds and DVDs and Blu-Rays will last me the rest of my life. I've read good things about The Bridge that is available with the the PerfectWave DAC. Might be a good thing to look into as opposed to the Sonos. I expect this weekend to get the center channel set up, now that the ZRACKS and SE84ZS are here. Greg, this is going to be an interesting ride you take us on, Greg. Like Tim, it will be interesting to hear your thoughts on the ERRs and OHMs although it is quite unfair to anyone or any piece of equipment to rely on audio memory. Still, looking forward to how this all comes together, especially with the center channel speakers inserted into the mix. In a way, I'm glad you memory might be a little thin on what you heard. Like Murphy's law goes. everything you listened to with the Torii-MKI was pretty bad. ZYGI, you know, even though your equipment wasn't working as it should have been the day that I was there, it still sounded pretty good to me. OK, I wasn't completely blown away but after leaving your place, I figured it was just the first time hearing the older Torii and it was my first experience with the both the ERRs and the Turning Point speakers so I figured I would just need to hear them again and temper my expectations. That afternoon by no means dissuaded me from looking further into them. What struck me then, and still to this day, is how you could take a room of modest size and make it into a very comfortable listening room with very good acoustics. Your room treatments probably took what you considered a sub-par listening experience and made for me a very enjoyable one. I can only imagine how the music must sound now! Still, as digital resolution and fidelity improve, and vendors find more immersive ways to enjoy album art and liner notes (holographically projected album art, anyone? No? ), and as bandwidth delivery systems continue to widen, environmental and financial pressures will drive to non-physical delivery of audio and video. Greg, I am with you that music and movies delivered via disc will, in the not-to-distant future, be [almost] a thing of the past. There will always be those who are comfortable with disc players but I think it will be more difficult to find that content delivered that way. I still have a Super-VHS camcorder that works just fine, but finding tapes for it is difficult and digital camcorders make it virtually obsolete. However, like Lon, I am not eager to embrace the world of computer audio. I know I should just get over it and get on with it but the thought of doing so is a little discouraging. The middle ground for me might be something like the Olive products, although going that route has its own limitations and, at the end of the day, it is not [yet] a priority for me. Lon, agreed on all counts. I like the idea of the Perfect Wave's source control capabilities, though I have the Oppo's volume control,, and its DAC section is very, very good. Less resolving than my modded PSA DAC with the Audiophileo, but musical. So, once I have the Ultra set up, the Oppo lets me play couch potato well. Devices like the PW, the Sonore, the Auraliti, the Oppo will keep converging and expanding our options. I actually think the PW DAC & Bridge are on my "next possible" list, because they should be much more effective ST serving my music from the NAS into the Ultra. The Oppo is good, but the PW combo should be great. And yes, hard drives fail, and so do SSDs, but less so. That's why I have two separate RAIDs and cloud backup. We will benefit from increasingly fail-safe storage. In reality, the PW is doing that for you transactionally already. It is converting optical disc storage (that can also fail and be easily damaged, like LPs) to information on the fly and buffering it. Eventually, we will have truly fail-safe storage and fully integral data delivery. As long as I can pass that information through my valves, I will be happy. Yes! More pics please! Enjoying his thread very much! Heh, Michael, pics will definitely be provided. The PerfectWave Transport is only storing about fifteen seconds of memory/buffer. . . and hopefully it won't fail, or will do so under warranty! I have hundreds of DVDs and Blu-Rays and I have thousands and thousands of cds. . . . If I never bought another, I'm really set for life, and I feel the PerfectWave combo is something that does them justice and will continue for a long while. I feel . . "set." I can't wait for your system to be all up, broken in and blowing you away! Yeah, I know it buffers only a few seconds, but that paradigm of "separate the read and interpret functions" is probably just the beginning of far more robust buffering. I was speaking abstractly. I have everything in place, with the exception of one center channel speaker and the still unfinished ZenStyx. I am only using one center speaker for now. But the racks are set up with the full complement of all the amps, and the mid-fi system, along with the Comcast PVR, Apple TV, Wii, and related stuff and the two PS Audio Power Plants. A little bit of cable management, and it will be well set. Small funny diversion: when I powered everything up, my SE84ZS did not want to start up. Checked the Power Plant sockets, checked the DRS cord, and finally checked the hideaway fuses, and voilà, no fuses! Not sure how she passed bench testing, but it was a quick and amusing fix. As it is right now, it is a delight. And I think I can make room for that PW DAC/Bridge. Wow, no fuses! That's indeed something I wouldn't expect! Is it kind of weird photo effect or I'm seeing fatter ERR's on the sides? Hey Juan, I think that is mostly wde angle distortion. I saw it, too, but it is also apparent in person. Sitting on the couch, the middle one looks thinner. So, I measured it. Same size. I finally figured out the real culprit contributing to the illusion: it's the Herbie's glider! By elevating the bottom of the speaker by about a half inch, and because of the slope of the sides, it makes the speakers on the side—that already hae the gliders insalled—look bigger. In a volumetric sense, they are. Anyway, I am closing in on HT nirvana. My wife and 15yo daughter alike spontaneously observed how much better the all-tube HT rendition sounds, especially in the bass and midrange. I still have the Denon hooked up, for cable, Wii, and Apple TV play. I am looking at 5.1 switching devices, that will permit me to route a collection of HD video devices through one switch, that can route the stereo/5.1 to the Ultra, while routing the video to a single input on the Panasonic screen. If any of y'all know any devices I should look at here, please chime in. I have looked at a variety of Phillips, Monoprice, Niles, and Atlona devices. Lon, although the PW DAC costs orders of magnitude more than those other devices, it looks like it could fulfill what I am looking for, though its audio output only appears to be 2-channel; Lon, any thoughts? BTW, that Panasonic Plasma on the wall is my 2006 52-inch screen. It is a very nice display, and is about 5+ years old. Tme for a refresh. It is being replaced by a new 65-inch Panasonic GT30 this Thursday. Much bigger screen display area, and much better blacks, 3D of course, that I don't much care about (yet), amazingly thinner and slightly lighter. I looked at the VT and just did not see enough ROI on the extra $1000 for the VT, while the GT had most of the VT features (like THX) that the ST lacks. The old one will go in the downstairs den, and I can put the Wii there. So, my challenge with the Ultra- based system is how to get the Apple TV and Comcast PVR into the Ultra. Since both units also generate HD video and multichannel sound, I really don't want to lose the benefits of my Decware system on those entertainment inputs. Greg, the PS Audio Perfect Wave DAC IS only two channel output, so not sure that will help. I think you need what I think they call an "AV Processor" and I confess I know nothing about those, my whole experience with video playback is just two channel. I've never had a 5.1 or 7.1 set up. I guess your Oppo doesn't have an input? Lon, after I took a closer look at the PW DAC, I realized it would not solve this particular problem. But I believe I found what will and what's great about this solution is that it allows the home theater to be all tube all the time. Am out and about but will post links to what I settled on later. No, the Oppo is close to, and could probably become a full front end, but my guess is that the market demand for such is not high. Hey sounds like a good solution on the horizon. I'm about to head out on a motorcycle ride to my brother's wedding in Ohio and back, so I won't be online much. Safe ride Lon! Be well and have fun. Here are the two items I bought to enable full use of the Ultra as a preamp front end for my HT system. Note that these would NOT be necessary if you use the Ultra only as a front end for an HT and one or two other 2-channel sources. (Steve, if you found some other way to solve this, please let me know.) But I have two other sources (HD cable and Apple TV) that have 5.1audio worth putting through the Decware system. Yes, I could run their HDMI outputs straight into the Panasonic flat panel, but the sound coming out of flat panels generally, and the Pannys specifically, is so atrocious, and it seems quite a waste to have this sort of audio system and not get the full benefit of it. 1. A 2x1 5.1 channel switcher. A 3.1 would have been more convenient, but it's not mandatory. Depending on physical layout and cabling, This will permit me to have two 5.1 sources running into the Ultra. When and if I decide to add a third, I will get one more of these. Biggest downside of these: no IR remote control. I have looked all over for one with IR, asked the vendors, etc. No luck. 2. A 4x2 HDMI-7.2 matrix switcher. This is what lets me separate the 5.1 audio channels from the HDMI supplied by the Cable and the ATV. Note that it is possible that this unit will be all I need. The folks on the phone and email—who were all great, BTW; HDTV definitely has my business for the future—sent me the user manual, and walked through it with me. We think it might be possible to plug the Blu-Ray audio out into the 4x2, along with the HDMI from the cable and the ATV. If that works, I am set, an I have remote control. Granted, this won't be quite as automatic as the current Denon system, because everything there is remote controllable. It's pretty cool to touch one rectangle on the Harmony remote control screen, and everything turns on and is ready ro go. But quality has its price, eh? Thanks for the pic, PR. I was too was wondering if what you needed was an A/V processor although I am not quite certain yet I completely understand the problem you were trying to solve and so didn't chime in. Outlaw Audio has done something kinda interesting. They will modify a Marantz SR-5005 receiver by disabling the internal amps for those who want to use external amplification. It is believed it will reduce noise caused by the seven amps and certainly will use less juice. For those who have equipment in a cabinent, I could see this reducing the amount of heat too. $500 delivered. Michael, thanks for the suggestion. I will check it out, but if I remember correctly, they don't disable the preamp segment, though, do they? Anyway, the problem is two-fold: (1) the Ultra only has one set of 5.1 inputs, or inputs that accommodate all 6 audio channels of a surround system; and (2) an increasing number of A/V sources deliver hifh quality video signal through HDMI, while the component outputs often do not deliver as good a video signal (my Comcast/Motorola PVR, for example), and even if they do, the audio is typically 2-channel. Thr Ultra is well designed for a single 5.1 front end, such as a Blu-Ray, plus three other 2-channel sources. The mixing capabilities provide ample redirection capabilities for putting that two-channel signal wherever you want it. But it's not the same as having multiple 5.1 or even HDMI inputs. In my system, I have the Blu-Ray player, which has a 5.1/7.1 and a 2.0 output, and I have the cable PVR and Apple TV. So, I need to get all those signals into the Ultra (or the Blu-Ray player, though the Oppo has no device switching capabilities). The 4x2 HDMI matrix switcher seems to do a good job of extracting the 5.1 signals, though there is a bit of brittleness to the sound (which could all be from the source device). The only problem I am now having is getting the Center channel to perform correctly. Even with a 5.1 signal, the only way I can get the Ultra to send out a signal is to flip the Norm/Mixed switch to Mixed. I turned out at first to have a bum (non-Decware) cable. Replacing that solved the zero output problem. But I am still not getting quite what I expect. I will get that one figured out or I will ring up Steve. It should be easy to test: pull the Matrix and input the Oppo directly to the Ultra. Greg, thanks again for another pic and for the explanation. I now understand better the issue. Michael, I have noticed that the Outlaw and Marantz units get good reviews. This Marantz pre-processor is impressive, and I could see using something like that to get the 5.1 properly decoded from the Apple TV and cable. If I have to. I may return the Denon to the system to give it a try for a while. I could connect the cable and ATV to the Denon for decoding, and hook up the Denon to the second sets of inputs on the amps. But that's small stuff to worry about. Right now, I have great 2-channel audio, great 5.1 out of the Blu-Ray, and very good mixed multi-channel out of the other sources. PR, What Denon do yo have? Lin, it's the AVR-2807, about 5-6 years old. Decent unit. The set up looks great, I have to ask however, why didn't you place the Torii's on top of the racks on each side? Mister symmetrical here asking! I love the addition to your signature.....Nice touch! @Tim: thanks, they are very involving speakers. And something like the SACD of Pink Floyd's DSOTM is pretty amazing. Bob, I have tried to decide whether to be symmetrical or not here. I actually want to get the set up re-arranged so nothing is on either top shelf. This one of those "compromising with video" problems. If I had no viewing screen, both Toriis probably would be on the top shelf: easier to tube roll, even better ventilations (though there is plent of air flow through the racks), showing them off, etc. But with the width of my wall acting as a bit of a boundary, I cannot move the racks completely to each side of the screen. So, I raised the screen just enough to remove it from the line of sight of the top of the rack + 4 inches. Something with very clean lines like the all-black Oppo works pretty well, but the Toriis, with their prominent AC lines and ICs, are a noticeable visual distraction. If you are the one person sitting straight on to the plasma screen, you're fine, but anyone at an angle gets a bunch of Torii silhouette as part of their visual experience. When the racks first arrived, and I set them up, I briefly thought: "Should have gotten the 36-inch height," because the lower 6 inches wold have been much easier for non-obsrruction of the video. But I soon saw the 42-inch version was indeed necessary. I could live without the extra shelf in a pinch, but not without the height. Tubes and cords need clearance. If I only had two Toriis, no problem, or maybe an Ultra and one Torii, or two SE amps. But I don't. I have the Ultra, 2 Toriis, and 2 SE amps. I have considered putting the two Power Plants up top, but they are neither the true feature of the system, nor matched. One other factor was limiting the length of analog cable runs. I wanted to keep the Ultra and front end Torii, close to each other, and the Oppo (with its analog outs) as close to the Ultra as possible. I first tried to put all amps, preamp, and Oppo on the same rack, and that did not work. Ah well, it will get sorted.